These Classic Retro Porcupine Meatballs are a taste from my childhood. If you were a child of the 70’s, I can almost guarantee that your mom made these. We ate these ate least twice a month when I was growing up and there’s nothing like my Mom’s porcupine meatballs recipe! Porcupine Meatballs Are Fast, Easy & Delicious! I’m not sure if you knew this, but I’ve been working on a SECOND cookbook! I know, right? What a surprise! If there was an award for sarcasm, I’d be a champion every year. Really though you guys, it’s crunch time. While getting in my manuscript was definitely an intense project, that’s nothing compared to the photography that was due. It’s all up to me, no help, no other photographer and let me tell you, this cookbook of mine is going to be stuffed to the gills with photos which means a lot of work from me again. I will have an official announcement soon as to where and when you can pre-order! Now, back to making porcupine meatballs! With being so busy that I’m working pretty much 10-12 hour days lately, I am returning to classic meals like you wouldn’t believe. I need tried and true recipes that aren’t fussy, that I know my kids will eat and that are easy. Place the canola oil in a large frying pan. In a large mixing bowl combine the rice, water, soup mix, garlic powder, ground beef and ground pork. Mix together well and form into 1 1/2 inch meatballs. Fry all of the meatballs until golden brown on all sides. When all of the meatballs are done , drain the excess fat off, then combine the last four ingredients together and pour over top of the meatballs. Place a lid on top of the saute pan and simmer on medium-low heat for another 20-30 minutes, until the rice in the meatballs is cooked, stirring every 10 minutes or so. Classic Retro Porcupine Meatballs are easy, amazing, retro and BOTH OF MY KIDS ATE THEM.Let that sink in for a moment. Both. Kids. That’s worthy of a fist pump into the air. Now wait, this gets even better, hold on to yer hats. My daughter SWIRLED HER PORCUPINE MEATBALL INTO HER PILE OF PLAIN BUTTERED RICE SAUCE AND ALL. Yes, I just screamed that at you in all caps. Every single parent of a picky eater just GASPED OUT LOUD, didn’t you? Some of you may have even crossed yourselves and sent a prayer to the Good Lord above. You don’t mess with the plain buttered rice. That’s what picky kids live off of. She intentionally put this sauce and chopped up meatball into her plain rice. It’s basically the end of the world. We demolished these last night like a pack of wolves. There are 5 meatballs left from the 25 that this recipe made and I’m quite proud to say that my son made these ( with a little teaching help from Mom, of course.) He’s tackling another recipe today, Baba Ganoush, so that will be on the website soon! We have the eggplants all roasted and he’s ready to rock! These classic retro porcupine meatballs brought me right back to my childhood as this is something we ate on an almost regular basis. I actually haven’t eaten them in years but they’ve been on that To-Make list that I keep in my head at all times. Finally the stars aligned and I had a few spare moments to cook in the evening instead of editing photos and voila! Here they are! How do you cook porcupine meatballs? I SWEAR that my mom used to just dump everything for porcupine meatballs into a roaster, cook it and then serve it up. I prefer using a skillet, as I find that it saves a step of transferring everything to a roaster The only thing that I sometimes change in the traditional recipe is to use half ground beef and half ground pork. I find that the ground pork makes for juicier meatballs. 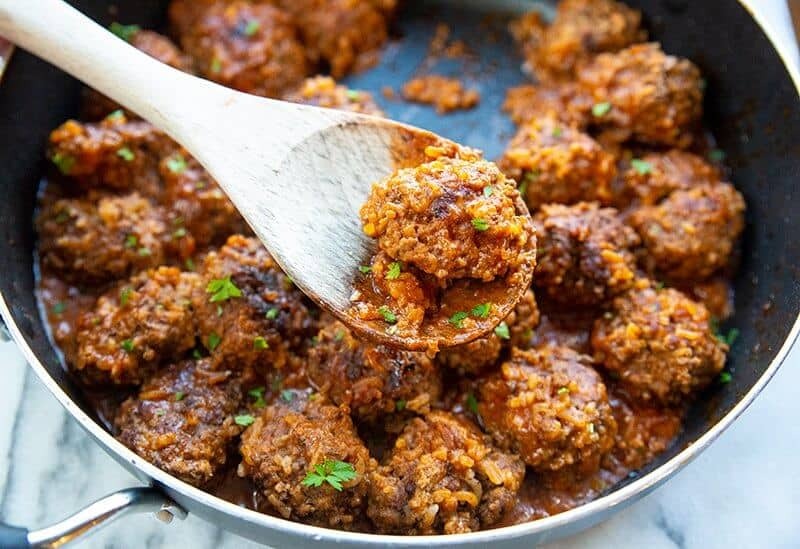 You can definitely double this recipe (I did) you simply need a larger skillet for the meatballs. You can use all ground beef if you like, but I suggest trying them with ground pork, they are so delicious! Nope! You don’t have to cook the rice before making these porcupine meatballs, that’s the beauty of them! The rice cooks inside the meatballs, helping to hold them together ( note I don’t use egg in mine, you don’t need to but you can add on if you like) and ends up perfectly done every time. I also use two pounds of ground meat, if you are going to go to all that effort then you should make enough for a few leftovers as well! This porcupine meatball recipe yields around 24-25 large meatballs. Try my Sweet & Sour Meatballs – this truly is the BEST recipe out there! Just use this recipe for meatballs and you are set! Meatballs with Mushroom Sauce – truffle oil makes these amazing! These Crock Pot Meatballs with Mushroom Gravy are a reader favourite! Want an appetizer meatball? 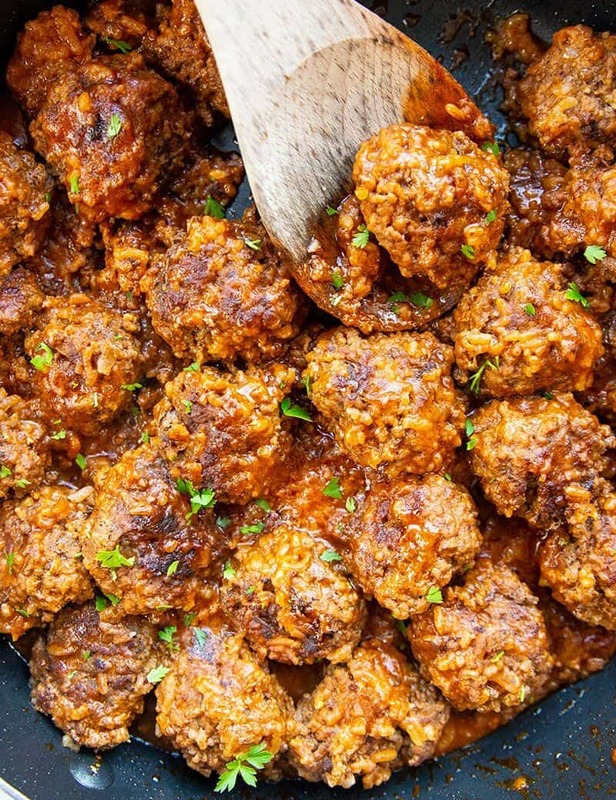 These Grape Jelly Meatballs are it! 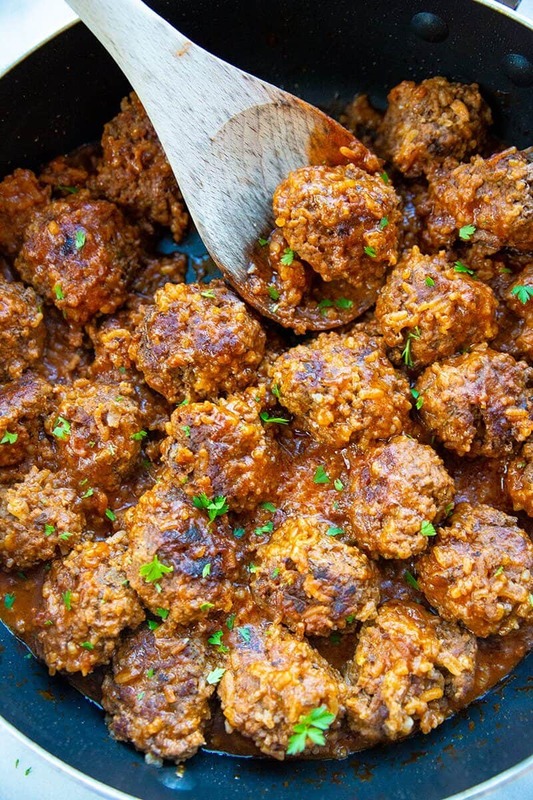 Homemade Meatballs – simple and you can batch freeze them! Pin this recipe to your DINNER IDEAS Board and remember to FOLLOW ME ON PINTEREST! How to make classic porcupine meatballs! These rice filled meatballs with tomato sauce are a one of my favourite recipes from my childhood! In a large mixing bowl combine the rice, water, soup mix, garlic powder, ground beef and ground pork. Mix together well (I always just use my hands since I have to form meatballs anyways) and form into 1 1/2 inch meatballs, around 22-25. They will be loose because of the water, but you need the moisture in there for the rice, trust me they will cook up nicely! Heat a large lidded saute pan and then fry all of the meatballs until golden brown on all sides. When starting, fry them for a long time on the first side, cooking them until they are really browned so that when you flip them they don't fall apart. When all of the meatballs are done , drain the excess fat off, then combine the last four ingredients together and pour over top of the meatballs. Place a lid on top of the saute pan and simmer on medium-low heat for another 20-30 minutes, until the rice in the meatballs is cooked, stirring every 10 minutes or so. I actually just shake the lidded pan back and forth to move things around. Serve and enjoy! We make rice and serve these and the sauce over top. You can double the sauce if you want a lot of sauce in this recipe easily, it will fit in the large saute pan. My mom used to make these. She would layer a casserole dish with minute rice, roll meatballs ( as above) , and place uncooked balls on top. cover all with sauce( need 1 cup to 1 cup ratio of liquid to minute rice) . She would pour additional sauce on top. Seal with foil and bake for about 45 mins at 350. Add more sauce as necessary, after removing foil, and continue to bake til brown. The rice was always SO yummy! Our family tradition adds finely chopped onions and celery to the ground beef and also Worcestershire sauce. Glad to see porkies are popular again! Why are they not spiky like porcupines? When I make them they are spiky. Haven’t seen a single recipe for porcupine meatballs on the internet that showed spiky meatballs. I have never had these!! I am going to try!! I feel like we grew up in parallel households! My mom made a casserole with rice, tomato soup and hamburger patties on top. She fried the patties first. Deconstructed porcupine meatballs, she was ahead of her time!! I make it an even lazier way with ground beef and onions. Mmmm I’m all for easier ways of making dishes! Gosh, made those when my kids were young! My poor mum – first time she tried to make these, the rice didn’t cook… we pretended they were fine and crunched our way through dinner. Oh my goodness! Your poor mom! I have a great recipe for these. Love them. I’ve made these for years but speed up the process a little in order to make a “time friendly” meal. I use 2 cans of tomato soup and about 3/4 can of milk. I heat this while forming meatballs (seasoning as you like, and include mixing in insant rice). After the meatballs are formed just drop them all in the soup. Cook 15 minutes and they’re done. While they cook I prepare rice to serve the meatballs and “soupy sauce” over. Quick and easy! My granny used to make these for me…\U0001f614 what a nice memory \U0001f60a thank you!! Sure hope you removed the needles first ! Har de har har ;). Oh, that’s a joke my dad would make! They are delicious, a true classic. I am with you…much prefer cookbooks with a photo for every recipe! Oh, it’s a must! It’s just a tease when you can’t see what the food is supposed to look like! Now you need to make them! Oh my goodness!! Have not made those in long time!! Will be in the menus this week!! we make ours in the pressure cooker, love ’em. I make these all the time! They are a big hit with my 4 year old who is picky about eating meat. Plus you can sneak veggies into them. They’re awesome! Thanks for the throwback recipe. I added in some franks red hot sauce for a kick, and they were delicious. The pork keeps these meatballs nice and moist. A must try. Hi Karlynn, I can’t wait to make this for my family – this is a classic that my husband brings up every once in a while and now I finally have a recipe to try! Do you think this could be finished in the crockpot instead of on the stove? Like 3-4 hours on low? Leanne B Yes, absolutely you can finish them in the crockpot on low like that. My mom made these too in the 1950’s. Recipe goes very far back. I just made your Saskatoon jam. I love it. So delightful!!! Glad that you liked the jam!! Oh that would be great too! Sounds good to place over broad egg noodles! I may place these in marinara sauce to cook! I’m pretty sure that I’ll crash right away lol! Holy mackerel… Wish I had that energy!